It seems that Autumn has arrived in the last few days. 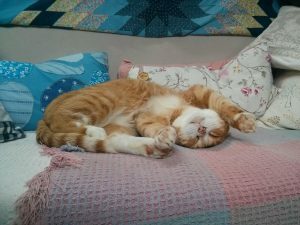 There is still a bit of summer to come as I share the rest of Pea Green’s adventures. My plan to head up the Ashby Canal looked in jeopardy after Monte’s swim and a weekend of trading. I decided to check if the trip was still doable and turned to the online Canal Planner. It suggested I could manage the trip in 4 days from Hawkesbury. However, this failed to take into account my 8hp engine, a dislike of more than 4 hours at the tiller and Monte getting fed up if he was kept in his travel crate too long! I left Hawkesbury after the blackberry overdose and on a gloomy morning made my way towards Marston junction. Passing the entertaining Charity Dock with its aliens and skeletons – hopefully none of the latter were real. Entering the Ashby Canal a tight turn! The Act of Parliament[i] for the Ashby canal was passed in 1794 but it was another 10 years before the 30ish miles were completed. Today, the Ashby Canal is 22 miles long, having ‘lost’ 8 miles due to subsidence. 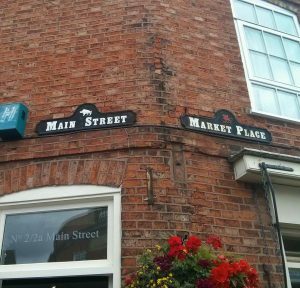 This lost section went through the town of Measham, famous for selling brown ceramic teapots at the Pot Shop on the High Street. Made in Derbyshire these teapots were decorated with colourful reliefs, often personalised, and ordered by those working the canal boats. Perhaps one day Measham will have a canal again. Since the 1960s the Ashby Canal Association has been working to rebuild the lost 8 miles, though not necessarily using the original collapsed route. Instead, they intend to construct the canal on a disused railway line. I can’t help but feel there is a certain smug irony to this, as the canal wins out over the train. The landscape surrounding the Ashby is mainly agricultural with stone built bridges. This combination makes for a lovely journey. What I found fascinating in the landscape is the evidence of medieval life with lots of ridge and furrow in the fields. This area of the country also looms large in the ending of the War of the Roses which resulted in Richard III being buried (and recently re-buried) in Leicester, and Henry Tudor beginning over 100 years of Tudor rule. My first mooring spot was near Bridge 22 from there I took a wander up to the village of Stoke Golding. Stoke Golding along with other nearby villages was close to the site of the Battle of Bosworth which took place in August 1485. 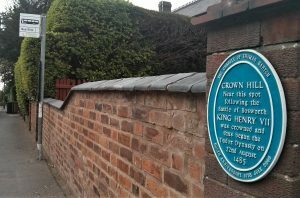 According to a blue plaque located on a wall in the village, and recent archaeological investigations[ii], this is where Henry Tudor acquired the crown after a hasty post-battle coronation. Handily the spot is named Crown Hill – clearly there could be no other place to reinstate a lost crown! Next to the plaque is a bus stop, it’s a shame Richard III hadn’t been able to jump on the local bus, if he had, perhaps the loss of his horse might not have been such an issue. Hindsight eh? For the villagers of Stoke Golding the experience that August must have been quite overwhelming. Before the battle 1000s of soldiers arrived. All needing food and drink and encamped in the area, and these were no small gatherings. Richard III’s army had between 10-15,000 men. Although Henry Tudor’s forces were smaller his armies included a large contingency of French mercenaries. Of course these numbers don’t include the families that accompanied their menfolk or other hangers on. The battle itself was largely fought in hand-to-hand combat. Legend suggests that some in Stoke Golding watched and listened from the church tower. Finally, after the battle, Stoke Golding villagers probably witnessed the crowning of the new king and were no-doubt involved in the bloody clean up of the battlefield. It is estimated that over a 1000 soldiers died and many were buried in pits in nearby villages. Shortly after he was crowned Henry VII paid for a chantry chapel at nearby Dadlington. Here the souls of the dead were prayed for. Chantry chapels were an essential part of medieval Catholicsim. The aim was to lessen the time the souls would spend in purgatory. I can’t help but wonder what conversations took place amongst the villagers that August. I wonder whether they realised the future importance of what they had seen. The last major battle of a 30 year civil war, and the final time an English king was killed in battle. 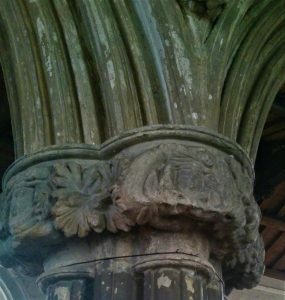 Of course finding medieval remnants in the landscape today is a challenge, and although Stoke Golding has a fascinating church with medieval faces staring out from the tops of the chancel columns much was left to my over-active historical imagination. Were those marks on the church window sills really made by soldiers sharpening their swords or is there a more mundane explanation? After a wander around the village I headed back to the canal and Pea Green. I spent the rest of the afternoon sorting bit and pieces on the boat I started to cook quite late. I lit the gas, only for it to die – I had run out of gas. Pea Green only has room for a single 13kg bottle of gas, so frustratingly I have no gas back up. Of course, by now everywhere was closed, so I had no chance of buying another bottle. An empty Stoke Golding wharf -next day it was packed! Next morning – feeling fraught as I had had no coffee- I made it to Stoke Golding Wharf and tried to buy a bottle of gas. This took on an element of farce, as I entered into the parallel universe of ‘canal time’. Without my usual gallon of coffee inside me this was not a good thing. At the wharf, which had been empty the day before, they were manoeuvring and bringing in a number of hire boats. 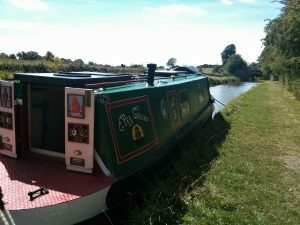 I was asked to moor opposite on the towpath side – but even this was a saga. There were mooring rings set in large squares of concrete. However in-between these mooring squares were squares full of soft, deep mud. The towpath elves had clearly designed a mud obstacle course, complete with signs saying ‘Deep Mud – Danger’. It was a relief when I managed to time my mooring right and avoided being sucked down into the mud as I jumped off. 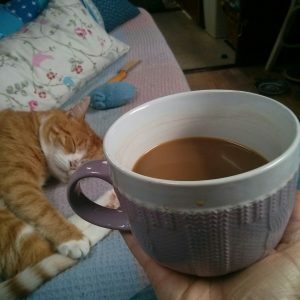 I finally get my coffee.. look how bothered Monte is! 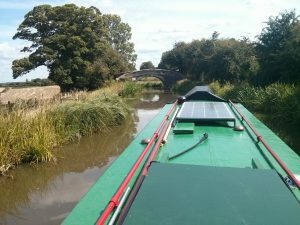 Moored up by lunchtime I was finally able to have my coffee, and the headache that had started earlier magically disappeared….. With my caffeine levels restored, and not a whiff of gas around I headed down the towpath to Market Bosworth. As with everywhere on this trip I was only 50 mins drive from my house, and yet ridiculously I had never visited Market Bosworth. The legacy of the battle looms large here too. The street signs showing either Henry Tudor’s Welsh Dragon or Richard III’s White Boar. It looks like they meet on the corner of the market place. I particularly liked the Fish Shop sign – the Batter of Bosworth…. Groan……. Next day I finally made it to the end of the Ashby. It felt a bit of an anti-climax, though I am not quite sure why! The end does have a lovely turnover bridge. Sadly nothing to do with apple turnovers, but designed to be helpful when the towpath switches sides. The entrances to the bridge face opposite directions on either side of the canal. As a result the horse isn’t lead around in circles. 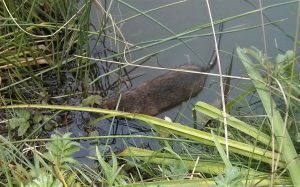 Another highlight was a close up encounter with a water-vole. I am not sure who was more shocked me or the vole. The sun was shining, and it was very quiet. I think I had expected more activity with it being the end of the canal. However it isn’t a wharf and most boats that arrived simply turned around and left again. What is impressive is the continuing work of the ACA and the restored section of the canal beyond the new swing bridge. The canal continues a little further under another bridge and ending with a winding hole. 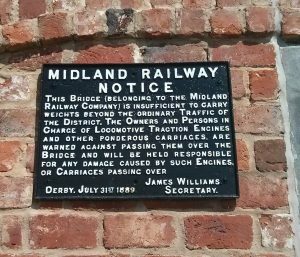 The final bridge has a great sign on it requiring ‘ponderous carriages’ to not go over the bridge. I do love a carriage that ponders. I went on Trip Advisor and searched for the local village of Snarestone to see what attractions it held. There was only only one ‘thing to do’ and that was the pub. From a history prospective Snarestone was a bit of an enigma. The church was well away from the village, across the main road and the village itself has some fine early 18th Century large houses. The highlight was, for me, the graveyard. It has some darkly entertaining pieces of poetry on a number of late 18th and early 19th Century gravestones. I should say here that my mantra over 30 years of travelling has always been, ‘you haven’t been on holiday if you haven’t visited a graveyard’. This is probably the most enduring reason why I have always travelled alone. Having exhausted the graveyard I by-passed the pub and headed back to Pea Green and Monte who appeared most excited to have reached the end of the Ashby. We had the same problem with losing our propane while sailing this summer. I had apparently not tightened the tank fitting sufficiently. Once we got the tank refilled we had no problems and the 10 lbs of propane the rest of our trip, but we did start shutting off the gas at the tank after every use. Kind of a pain but we didn’t want to take any chances since the stuff is heavier than air and can collect in your bilge waiting for the right moment to blow you to smithereens. We never had any gas inside the boat (the tank lives on deck) that Diane’s bloodhound nose could detect, but a full tank disappeared in a week. Really enjoyed this leg of your journey , lots of history ! My sister spent her first years of teaching in Leicestershire , living in Stoke Golding and has walked along quite a lot of the canal there , as have I . I agree , a lovely peaceful part of the country . So what now ? Will you moor up there or bring the boat back to Welford ? The gas bottle trauma sounds a bit worrying , i hope all is well now . i carry two half size bottles in the van so that i always have a spare and replace each one as soon as I can , after it is empty . Maybe not practicable if sources of gas are scarce . Just a thought ! Yes the next post I will be writing about heading back along the Ashby. Re the gas – the gas locker doesn’t have the space for two bottles of any size. The boat safety scheme is quite stringent about whathow you can have it stored. It’s kind of like a boat safety MOT that has to be carried out every few years. A real informative blog Kay and an amusing farce concerning obtaining the replacement gas bottle etc – hope all is OK now though? I too was disappointed at the end of the Ashby canal and felt sad to see the remains of the canal filled in and wondered what those men would had thought if they had known when they were digging the canal that part of it would now be closed! Snareston tunnel is an experience with its extremely low headroom and various kinks etc which assisted me in reshaping my chimney slightly – woops!